While in London for a conference on food waste reduction last week, I couldn’t pass up the opportunity to visit what was described to me as a “food waste café” — or, better stated — a café that makes use of excess food donations (food that would otherwise likely go to landfill) to prepare healthy breakfast and lunch dishes for community members. That’s Café Morningside in Hackney — just a few brief train rides outside of central London. 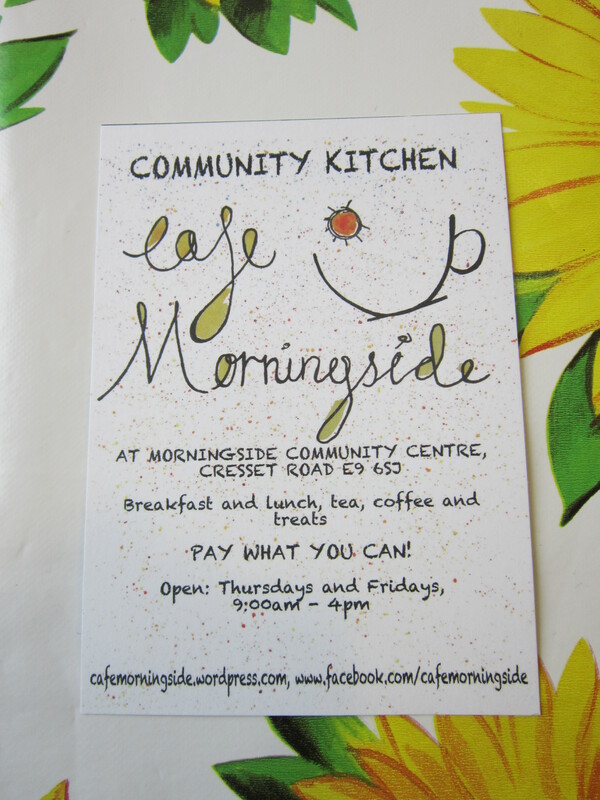 Café Morningside is currently open two days a week (Thursdays and Fridays) for breakfast and lunch (along with takeout lunch boxes) at the Morningside Community Centre. As co-founder Lise notes, the set-up, meal preparation, and pack-up calls for “a lot of energy for two days.” The two-day structure helps to facilitate their operational planning for volunteer cooks and staff. Notably, it also helps retailers and other donors plan for what, and how much, they will give each week. Those donations are then transformed into a variety of excellent meals by cooks from several countries. Since the cooks don’t know what types of food will be received each day (nor how much), the model calls for resourcefulness and creativity in the kitchen — similar to what occurs in many food banks today. The menu is decided each day based on what food comes in from donors. For example, frozen chicken is donated from a restaurant chain, while organic fruits and vegetables are donated from retail food operations. On the day that I visited, the chef prepared a tomato and cheese pasta dish (which was excellent) as well as a chicken entrée. Some prior meals shown on the website include a vegetable medley, French onion soup, stuffed peppers, a frittata, and a chickpea curry with potato cakes. There is a recommended price for the entrée dishes, but the “pay what you can” concept allows for struggling individuals to pay little (or no) money for a healthy meal, while those who have the ability to do so can pay a little extra in order to provide a meal for others in need. I applaud the concept; it is great to see another start-up business model built on harnessing the value of excess food and, in the case of Café Morningside, merging that value with the social benefit of bringing people together for healthy food and enabling more affluent individuals to pay a little extra to provide for those who are struggling (i.e. “suspended orders”). Indeed, the concept of “community” stands out very clearly at Café Morningside. Further, donors benefit from reducing waste disposal costs while generating goodwill among employees and customers, volunteers get a sense of “giving back” to other community members, and cooks get the ability to test their creativity while sharing recipes from their homelands. While enjoying my lunch at the Café, I reflected on a comment from Barton Seaver (of Harvard’s School of Public Health) one day earlier at Carrier’s Cold Chain Summit in which he referenced the “Reduce, Reuse, and Recycle” campaign. Seaver noted that this has been one of the most successful Ad campaigns to date, yet he also pointed out that we haven’t sufficiently addressed the first “R” — Reduce. I couldn’t agree more. He went on to comment that we need to change the way we interact with nature to promote sustainability efforts. Café Morningside’s founders are doing just that — making a concerted effort to reduce food waste by putting excess food resources to good use while also creating a strong sense of community. So when in the London area, take a trip out to the Morningside Café for a great healthy meal. Or, if you live in the area, consider volunteering or partnering to provide food donations to help sustain the operation. Either way, you can help the team members achieve their mission of helping both people and planet simultaneously. Great idea! I see so much waste where I work.